Born in 1933 in Warsaw. He is an embryologist, founder of the school of experimental mammalian embryology. He graduated from the Faculty of Biology and Earth Sciences at the University of Warsaw in 1955. He obtained his doctoral degree in 1960 and his postdoctoral degree in 1964; he received the title of professor in 1972. His entire research career has been linked to the University of Warsaw. He was head of the Department of Embryology in 1964-2003, and director of the University of Warsaw’s Institute of Zoology in 1972-1981 and 1987-2002. He has worked with leading research centres all over the world. Thanks to a grant from the Rockefeller Foundation he worked at the Department of Zoology of the University College of North Wales (1960-61); he has been a visiting professor at the University of Oxford, the Rockefeller Institute in New York, the University of Adelaide and the Institut Jacques Monod (CNRS, Paris), to name a few. He has been a member of the Presidium of the Polish Academy of Sciences (1990-92), vice-chairman of the General Council of Science and Higher Education (1982-85), chairman and later member of the State Committee for Scientific Research’s Unit for Biology, Earth Sciences and Environmental Protection (subsequently at the Ministry of Science and Higher Education, 1997-2004), a member (1997-2000) and vice-chairman (2000-2004) of the Council of the Foundation for Polish Science. He is a member of the Polish Academy of Sciences and the Polish Academy of Arts and Sciences and a foreign member of the French Academy of Sciences, the U.S. National Academy of Sciences and Academia Europaea. He has received numerous awards, including the Japan Prize granted by the Science and Technology Foundation of Japan and dubbed the “Japanese Nobel Prize” (2002), the Albert Brachet Prize from the Royal Academy of Belgium (1980), a state prize first degree (1980), an award from the Alfred Jurzykowski Foundation (1985) and a prize from the International Embryo Transfer Society (1991). He has been granted honorary doctorates by Jagiellonian University (2000) and the Medical University of Łódź (2005). Prof. Andrzej K. Tarkowski – winner of the FNP Prize in 2013 in the life and earth sciences, for discoveries explaining the fundamental mechanisms responsible for the early development of mammalian embryos. 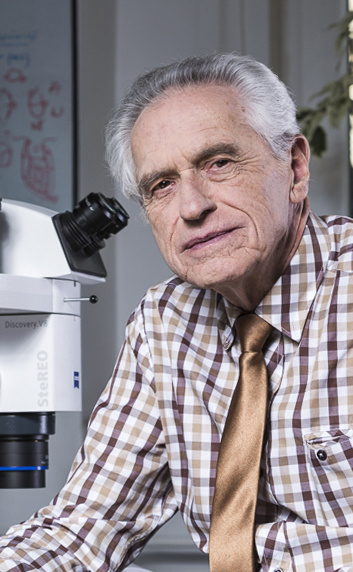 Prof. Andrzej K. Tarkowski is among those who built the foundations of contemporary mammalian experimental embryology. His pioneering research on the developmental potential of embryonic cells was conducted on mice. One of the effects of these studies was the formulation of the “inside-outside” hypothesis according to which the development of the first two cell lines in an early embryo depends on the cells’ position. Cells lying inside the embryo form the inner cell mass (ICM), while cells outside the embryo develop as trophectoderm cells. The ICM later develops into the foetus and most of the foetal membranes, and the trophectoderm – into the embryonic part of the placenta. Though subsequent research showed that the mechanism by which the first cell lines develop is more complicated, the position of cells in an early embryo is still a major factor determining the embryo’s further development. Prof. Tarkowski has also shown that normal adult individuals can develop from isolated single cells of early mouse embryos (even those of several cells). These observations, confirmed in other mammal species as well, testify to the great regulation capacity of early embryos in this group of animals. The developmental plasticity of embryonic cells has been confirmed by another research project of Prof. Tarkowski’s in which two several-cell mouse embryos were experimentally combined. The result was the first-ever chimaera – a normally developed individual built from the cells of two different embryos, i.e. having four parents. Today mouse chimaeras are an important tool in research on embryonic development, cellular differentiation and stem cells as well as being widely used to obtain genetically modified animals. Prof. Tarkowski’s research has provided vital insight into fundamental issues of mammalian embryonic development. It has had a crucial impact on the development of technologies connected with cloning and pre-implantation diagnostics, for example, as well as inspiring many scientists around the world to continue and develop the professor’s discoveries.